She completed AMC Certificate in Melbourne in 2011 and then in 2012 completed Certificate of Women’s Health of RANZCOG. During her training, Dong worked in Emergency, General Medicine, General Surgery, Paediatrics, Obstetrics & Gynaecology, Mental Health, and Geriatrics through various Metropolitan and Regional hospitals in Victoria. 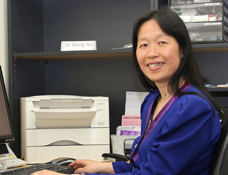 She has also completed her GP training successfully in Medical Clinics in Central Gippsland, Victoria. Dong commenced working at Belgrave Medical Clinic in Oct 2014. Her special interests include Women’s Health, Antenatal Care, Dermatology and Mental Health. She is also competent in minor surgery, eg skin lesion removal, joint injection and Implanon insertion & removal. In her spare time, Dong enjoys spending time with her family. She is able to speak English, Mandarin and Shanghainese.